This heavy weight cookware is made from 1/4" aluminum alloy for optimal hardness and durability. NSF listed and computer controlled manufacturing creates a double thick top edge and base for superior strength and shape retention. 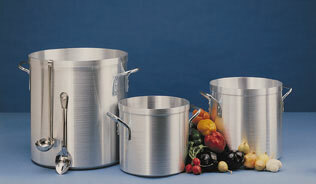 3003 alloy allows cookware to heat rapidly and retain even heat. Optional covers listed below.